Within a ten block span of Manhattan right now, the early work of three very different, but fiercely original iconic artists of the twentieth century is on display: sometimes we get lucky. Though two of the three men worked in Paris (Calder and Picasso) and the third not far away in Bologna, they inhabited very different artistic spaces. Yet they share this: each marched very much to his own drum, and in the case of Calder, whose magical Circus is the focal point of the Whitney retrospective, literally. To begin with Calder is to begin with delight. Calder's signature work, the Circus acquired in 1982 by the Whitney, is now in its most expansive installation yet. I was invited a few times to the summer home of a dedicated Calder collector when I was in college. Each day we awoke to the soft dangles of the mobiles (the whole house had been decorated in Calder reds and blue) and I eagerly eyed the dramatic and elegant Calder jewelry his wife wore. When the Circus was first installed on the ground floor of the Whitney, I waited patiently to get his signature on the small brochure; the squiggly, red A C reminds me exactly of the wires of the charming figures he so expertly created and then personally animated in the ring. To see the Circus film, and other film documents at the Whitney, is to re-enter into that magical world. Calder had been born in the US but his artistic family had spent much time in Paris and he moved there in 1926. He immediately took up with the artists and performers in Montparnasse, gradually moving from painting to his wire sculptures and a concomitant freedom and lightness of spirit. It is impossible not to smile at the toys and wire figures that are jejeune but ingenious. Just a few blocks north at Acquavella Gallery, Picasso is represented at almost exactly the same period with very different inspiration and results. Picasso was chafing under the social aspirations of his Russian wife Olga, who had originally been a freer spirit ballerina. 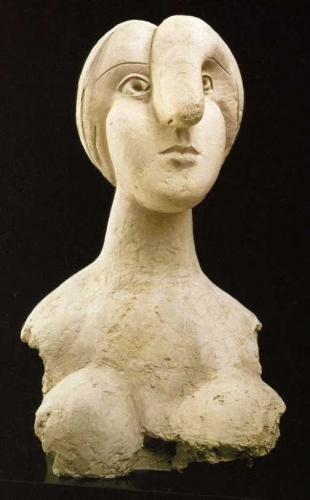 In Paris, in January, 1927 he met Marie Therese Walter, a voluptuous 17 year old who was leaving the Galeries Lafayette and fell madly in love (and lust) with her; the extraordinary collection of paintings and sculpture that were inspired by her are united here. It is very, very special, a real coup for the gallery. Some we are familiar with from museums here and abroad. But a few are in private collections (Stephen Cohen is doing some good things with all that hedge money) and may never be seen in a public venue again. What comes through as you make your way through the intimate galleries is the overwhelming desire he had for this young woman. His style changed when he began to paint her, rounding her body and her distinctive features into the distinctive black lines that became a hallmark of this period. Around the corner, the Metropolitan Museum, has discovered some very special early work by Giorgio Morandi, known mostly for the elegant, refined and almost abstract still lives of his later work. These early pieces are my favorite -- again, more or less concurrent with the Calder and Picasso works. A cactus he painted when he was hanging out with DeChirico which was found to have a self portrait on the back when they cleaned it for this exhibition and a couple of still lives from 1916 show that Morandi's interest in the abstraction of shape began very early in his career -- some of the same bottles and vases reappear years later. An afternoon or early evening ramble to the three exhibitions will alternately lift your spirits, take your breath away, make you contemplative, and give you welcome respite from the stomach-churning economic and political news of the day. Do not miss them.